Long before the crack of dawn two ambitious young athletes rolled out of bed, ready for their big challenge! Here they are with their Good Will “jackets” – looking pretty chipper after 3 days of rest and good food. 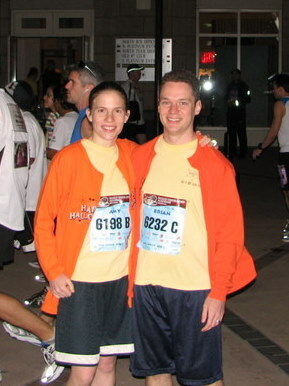 The shirts served their purpose and were unceremoniously discarded before the second mile. It does help you keep up with each other in the crowd! The race was hard, there was also a stiff wind blowing and fighting it took a lot of energy. It made us glad that we weren’t pushing Lance in the stroller, it would have been like heaving a sailboat up wind! 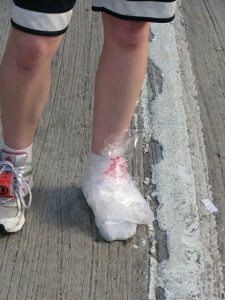 The weather turned out warm for Dec (75º) which we enjoyed but the heat really took its toll on some of the runners. We made sure we stayed properly hydrated by making use of the aid stations along the route and now we both have an aversion to yellow gatorade. Our run went pretty good over all. 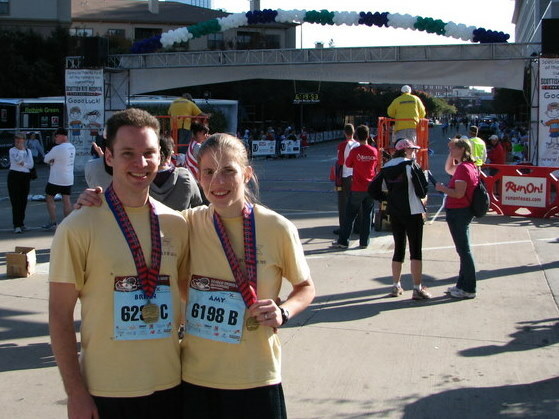 I had a rough time around mile 19 but Brian cheered me on…that and the help of some marathon goo (yuck). We walked and jogged for a few more miles while Brian tried to distract me by any means he could think of – sweet guy. When we hit the last mile I knew I had to run to the end and so we did. I quoted scripture in my mind to keep the focus off of my legs and we crossed the finish line right at our time goal! I was happy, and beat, and wanted to cry and was proud of Brian all at the same time. Not quite so chipper but still smiling after 5:04 hours of running! The new marathon alumni pose at the finish line.